Wooooo-weeee! It’s almost Friday, y’all! I’m so ready for the weekend! My family kinda fell off the Friday night pizza night train when we moved to Phoenix …. it’s just too darn hot to be having that oven on! Everyone once in awhile, we (by we, I mean I) drudge through and give into our craving. I wanted something a little bit different for our pizza on this occasion …. 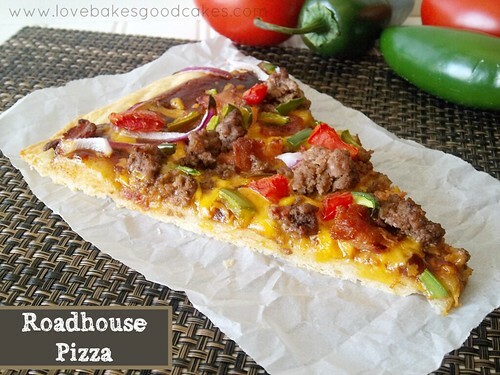 I came up with the Roadhouse Pizza – it’s topped with BBQ sauce and a combination of yummy ingredients like ground beef, bacon, jalapenos, tomatoes, onion and cheese! I wasn’t really sure what to call this pizza, but for some reason, the word “roadhouse” stuck out in my mind – so that’s what we’ll call it. Mmm-kay? I have no rhyme nor reason to what I do, what can I say?! 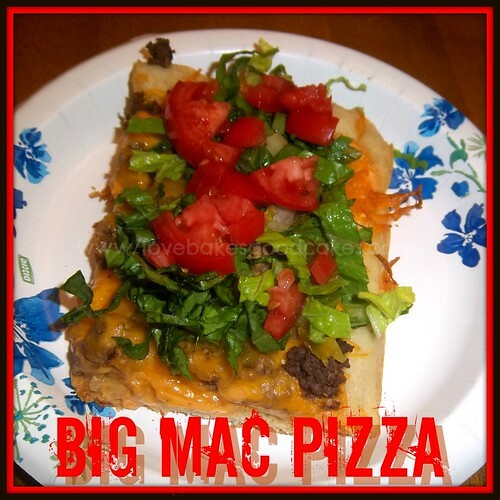 If you enjoy pizza night at your house, I hope you’ll give this version a try …. it has become one of my new absolute faves! Prepare pizza dough according to recipe directions. Preheat oven to 450°F. Grease a pizza pan. Pat dough into pan. Drizzle with olive oil and bake for 10 minutes. Spread BBQ sauce on pizza, using as much or as little as desired. Top with half of the cheese. Top with beef, bacon, jalapeno, tomato and onion. Sprinkle remaining cheese over the top. Bake for 15-17 minutes, or until the pizza is golden and the cheese is bubbly. Oh ! Wow, it looks great, Jamie ! Pinned 🙂 Roadhouse? You might have had a pizza along the moving and 2 + 2 = roadhouse? It's not even 6am yet and I want that pizza. LOL Visiting from Simple Living and Eating. 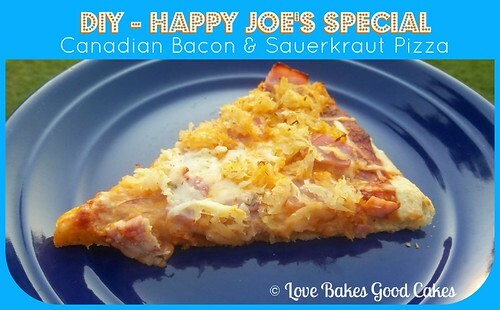 Jamie, this looks so good and now I absolutely want pizza for breakfast! 🙂 Thanks for sharing and have a happy Friday! I've been considering doing a pizza challenge. Maybe trying to make 40 different pizzas and tracking my progress, taking pictures, etc. I'm pinning this recipe in case I end up doing it. Looks YUMMY. As a Friday Night Pizza Girl myself I can totally relate to the hot oven issue. I recently started cooking them on the BBQ and am finding it works great. Thanks for sharing the recipe looking forward to trying it. It has been in the 90s here in NY. I can't image what it is like to live with such intense heat, 100 plus for months.. Well this pizza was worth turning the oven on for.. looks incredible. Thanks for sharing it with us on foodie friday. I agree, the Roadhouse pizza sounds good. I'll try that combination next time I make pizza. My most recent adventure was a 'taco' pizza with black beans and corn and a bit of chorizo. Your pizza looks good. Love all the different toppings! Thank you for linking up with Foodie Friends Friday! Please come back this week for another party! I can't resist bacon on a pizza. My fav is chicken, bacon, roasted peppers. Your pizza is LOADED with toppings! You can call it whatever you want. It'll still be great! Thanks for linking! Pinned it to try later! It looks sooooo good! This may sound silly but I love the white paper the slice is sitting on… where did you get that or what kind of paper is that? The name is very fitting 🙂 We are a Friday night pizza family too..I need to give this a try next! Thanks for linking up at Share Your Stuff Tuesdays! I love the ingredients! I put roasted jalapeno's on my pizza, but haven't tried BBQ sauce. Must try this. 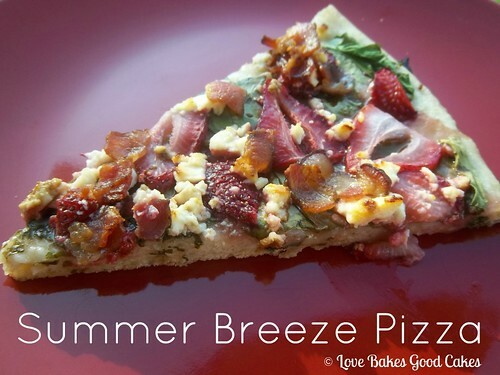 We will just love the flavor of this Pizza, can't wait to try it! Thanks for sharing with Full Plate Thursday and hope you are having a great weekend! 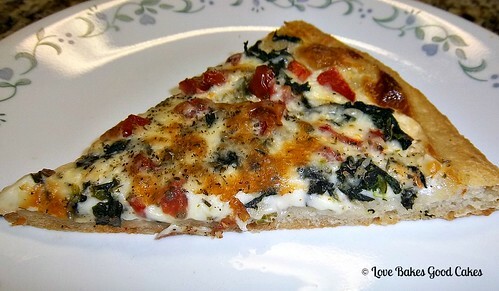 Thanks so much for sharing this wonderful pizza at the In and Out of the Kitchen LInk Party. It was the most clicked during the party and will be featured on Monday! G'day and WOW your Roadhouse and Summer Breeze spoke to me today! This looks absolutely delicious! Thanks so much for sharing at the Foodie Friends Friday link party this week!